In February 1966, leaders of the Buddhist Churches of America, at their National Conference, held in San Francisco, CA passed a unanimous resolution to purchase a building to house the school for the training of Buddhist minsters to meet the changing needs of the membership and society. The school came to be known as the Institute of Buddhist Studies. Now, 49 years of dedicated commitment to establish the school, we have grown, with the support of the Friends of IBS, to a Graduate Seminary for Shin Ministery, Buddhist Chaplaincy, and Shin and Buddhist doctrinal Studies. 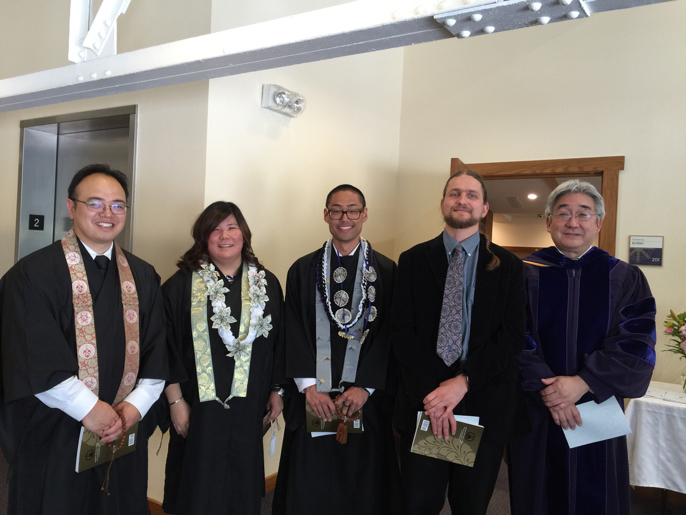 Our Shin Buddhist Minister students (IBS MS), upon graduation and completion of their ordinations can serve as Kaikyoshi (head) Ministers in our churches and temples. Chaplaincy Students (IBS CS) can serve, in hospitals, prisons, military, healthcare facilities, hospices or serve the needs of their own Buddhist communities. Shin and Buddhist Research Students (IBS RS) can study to become teachers and authors to spread the Buddhist teaching in the academic world. Our students come from all religious traditions with a strong emphasis on Buddhism. It is a diverse group who study together and share their teaching with each other with deep respect To support our diverse student body, and fulfill the dream of our pioneer leaders for the future, we at IBS, have established Scholarship programs. or call us at (510) 809- 1444. In Gassho with palms together.